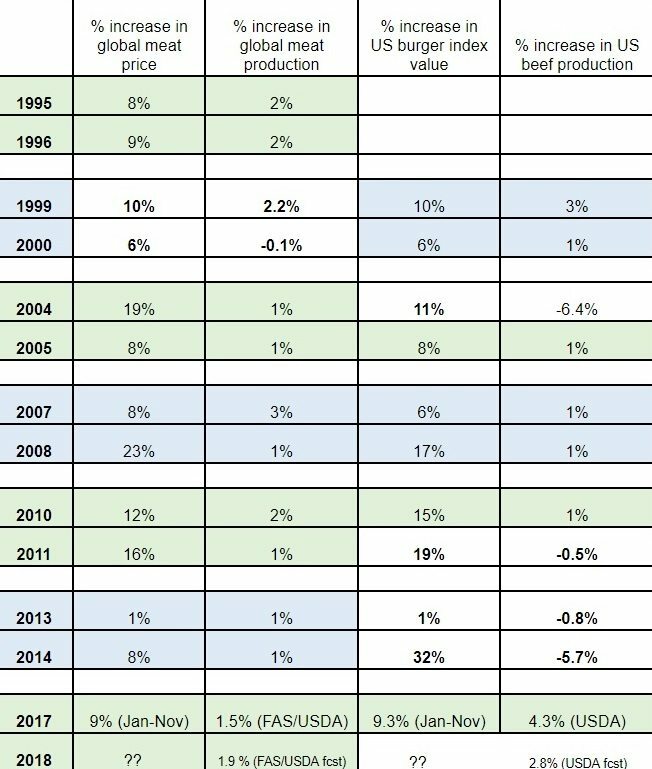 Is Australian beef still facing a ‘Super Demand’ cycle? Ten months ago, Beef Central published a discussion paper written by independent industry analyst Simon Quilty suggesting that the Australian beef industry might be about to enter a two-year ‘Super Demand’ cycle. Has anything changed to alter than view? I’VE not long returned from four weeks of business travel in North America, Europe and Asia where I saw first-hand how meat demand is and the general economic feeling across these continents. 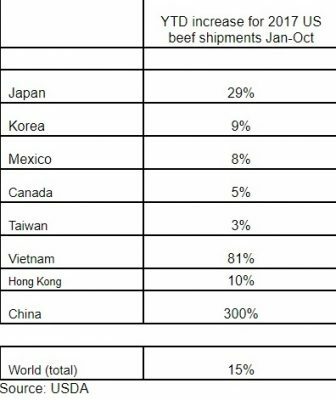 There is strong anecdotal evidence that beef demand is good in both developed and developing economies and in particular, the US domestic market. The US economy is thriving along with many other global economies and in the last quarter of 2017 much of the statistical data from Australian and US exports have supported these findings. This point has driven me to re-examine predictions made back in April 2017 on the prospects for a ‘Super Demand’ cycle, and to review my belief at the time that we were at the start of a two-year strong demand cycle globally that would see beef prices remain firm and rise progressively for all of 2017 and 2018. So is this ‘super demand cycle’ alive or dead? 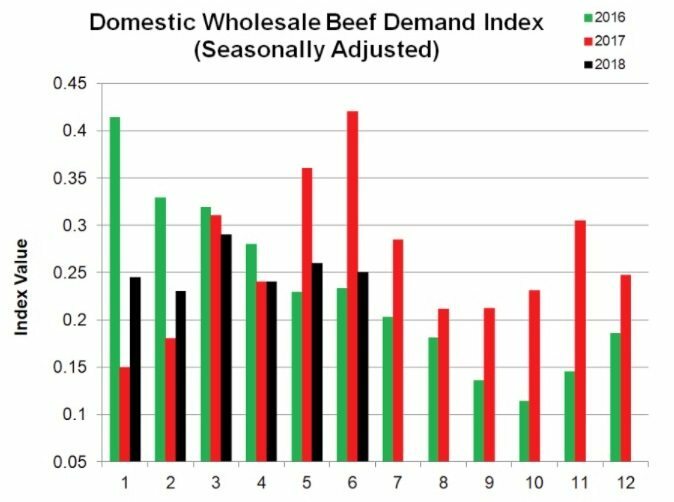 The original discussion paper published last April raised the possibility that the global meat market was heading into an unusually strong period of demand, that I termed the ‘Super Demand’ cycle. Strong global demand cycles normally last for about two years, though due to restricted global supply, the period could be longer this time. In each instance 2017 lived up to my expectations of strong demand with firstly, global and US beef prices indeed moving in tandem both increasing by 9pc; US and global meat production were up 4.3pc and 1.5pc respectively; and US exports remained very strong, being up 15pc globally with Asia continuing to be where the largest demand came from. All indications are that 2018 will see strong global demand continue. In short, the ‘Super Demand’ cycle is alive and well, and on track to continue through 2018. I am now wondering if it will extend into 2019, as many of the key demand drivers are showing signs of remaining in place potentially into next year. The US economy is in extremely good shape and the one common term I kept hearing when traveling recently was ‘growth’ – whether it was food manufacturers or other industries such as aviation, steel or pharmaceutical production the same message was ‘growth, growth and more growth’. Almost all US sectors were expanding, building bigger factories and most importantly employing more people. The US meat market has been described by many as the engine-room for global beef prices. As highlighted in last year’s original discussion paper, I thought that during this period of ‘Super Demand’ that global beef prices were having a bigger influence on US prices than vice versa. But I am now willing to concede that in 2018 the US might rule the day, given the extraordinary strength of the US economy. US unemployment is at 4.1pc, which is the lowest level in 17 years and the second lowest in three decades, with the only other lower unemployment period being Q4 of 2000. Effectively it can be argued the US economy is in full employment. US Manufacturing PMI: Increased to 55 in December of 2017 from 53.9 in November and beating market expectations. The reading pointed to the fastest expansion in manufacturing since January amid sharper increases in production, new orders and employment. US Tax law changes: Passed just prior to Christmas, the Tax Cuts and Jobs Act was signed by President Trump on December 22, and promises to bring financial benefits to US meat and poultry processors. Company tax rates cut from 35pc to 21pc. Taxpayers likely would see the first changes to their payday tax withholdings in February. Estimated middle-income US households would see an average tax cut of $1170 next year under the bill, while the wealthiest 1pc of Americans would see an average cut of $66,500. The bill has a cap on deductions for state and local taxes which impacts the high-tax states of New York, New Jersey and California. The bill removes a tax penalty under the Obamacare health law for Americans who do not obtain health insurance. US wholesale beef demand and November cold storage stocks throughout 2017 have been in good shape, particularly in the May/June period, and the 2018 forecasts outlined below might be light, particularly for the May/June period. But the indications are clear for an upward trend for 2018. The draw-down in November cold storage stocks indicates that US domestic protein demand remains in good shape, the total supply of beef, pork, chicken and turkey in cold storage at the end of November was 4.9pc higher than a year ago and 10.2pc higher than the five-year average. But importantly, the draw-down in stocks during November was 10.7pc, compared to 9.3pc average of the last five years. What was particularly noticeable was the drop in pork inventory, considering the increase in slaughter capacity and additional production in the last few months. As highlighted earlier, one of the characteristics of the ‘Super Demand’ cycle is the moving in tandem of prices with US larger prices and global meat prices. The table below highlights that this has been the case this year, with global meat prices up 9pc and US burger prices up 9.3pc. The question on US demand and pricing is whether export demand is driving up US domestic prices, or whether the local US demand is so strong that it is driving up global demand. I am still of the opinion that export demand is having a major impact on US domestic pricing and given the strength of the US economy, I believe US consumers will continue to pay higher prices for beef and all other proteins. In previous ‘Super Demand’ cycles, the second year of price increases saw prices rise anywhere between 6pc and 32pc (see table above). I think a 32pc increase is unlikely this time, but a price rise of somewhere between 6pc and 16pc is a possibility. I do put an important caveat on this view, outlined below. That is that competing meats, and in particular chicken, could change this view and lower this price expectation if chicken production is 4pc or higher (compared to last year). USDA forecasts at the moment are for a 1.6pc increase in production. When first looking at global beef demand last April, there was much anecdotal evidence that supported the belief that demand was good in Q1 of 2017. The fact that quota levels into both Japan and Korea were triggered by the US and Australia throughout the year – meaning both countries shipped large quantities of beef and forced extra duties to be imposed on each countries beef as a result of strong demand. US beef exports were up globally by 15pc for 2017 compared to Jan-Oct 2016 and 25pc higher compared to the same period in 2015. This was to all key destinations but in particular to Asia with 80pc of the increase in exports going to the Asian region. Japan took the lion’s share of the increase followed by Korea – but it continues to reiterate belief that the growth in global demand is in Asia. Canadian’s expenditures on food will rise sharply in 2018, particularly on food purchased outside of the home, according to “Canada’s Food Price Report 2018.” The annual food expenditure for a family of four is expected to rise by C$348 to a total of C$11,948, the report said. UK beef finishers and industry sources report continued strong demand for stock despite the increased kill, with some factories struggling recently to get sufficient numbers for pre-Christmas contracts. UK analysts predict that supplies will continue strong for the remaining weeks of 2017 and into the early months of 2018, before the impact of the surge in calf exports this year filters in to bring about an easing in stock numbers. Last year was the strongest year on record for Irish meat exports against a difficult backdrop, with meat exports worth €3.8bn. Irish meat group, Bord Bia released figures recently showing that beef exports grew by 5% to €2.5bn. Japan’s economy expanded at a 2.5pc annual pace in July-September 2017, the seventh straight quarter of growth and the longest period of expansion since 2001. This is due to revival in export manufacturing which is helping sustain Japan’s recovery, with strongest growth in shipments of vehicles, power generating equipment, computers and computer parts and semiconductor machinery. The Japan export volume index was at a three-year high in November and is expected to continue. Indonesia’s real GDP growth is projected to increase to 5.3pc in 2018, according to the World Bank’s June 2017 Indonesia Economic Quarterly. As a result private consumption is expected to increase with moderate inflation, stable exchange rate, stronger consumer confidence, and low consumer lending rates. Malaysian Government officials three months ago admitted that the country would continue to face shortages of local beef and would be dependent on imports. Due to the shortage, officials said that Malaysia was forced to import livestock products from Thailand and Australia, as well as frozen meat from India. This shortage is not only experienced during festive seasons, but year-round. The Government admitted that unless domestic production is increased, it would continue to import more beef to meet the demand. The Government suggested that one means of addressing the issue was to encourage more entrepreneurs to venture into livestock market by opening cattle farms. The prices of foodstuffs and beverages in South Korea for November were up 4.5pc from a year before, the third highest after Mexico’s 4.9pc and Japan’s 4.7pc, according to the OECD’s tally. South Korea was second in October and first in September when looking at pace of food price inflation amongst OECD countries. The decrease in domestic beef production pushed-up the price of beef, which also raised the price of pork due to its higher demand as a beef alternative, South Korean officials said. I am intrigued by some of the market price forecasts in recent times suggesting that due to an increase US beef production this year (likely to increase by 4.8pc this year) that US domestic prices will fall. I do not follow this logic, nor believe it. The concern with this view I believe is that US demand continues to be under-rated by many market participants in terms of its ability to cope with the larger volume of red meat and poultry. Once again it is the fear of the ‘wall of meat’ that is continued to be talked about – but such a prospect is always talked of at the start of any year in which more supply is expected, and this year is no exception. What is important to note is that increased US supply is already here, and Q4 of 2017 saw an increase in beef of 3.6pc and an increase of total meat protein supply of 2.8pc and yet beef prices traded significantly higher year-on-year, with beef cutout prices 8.7pc higher and fresh 90’s prices traded 11pc higher. Yet production was up significantly across all meat items – the supposed wall of meat came and went. This can only mean that US demand is outperforming supply in Q4 in what is often regarded as an average demand period normally. 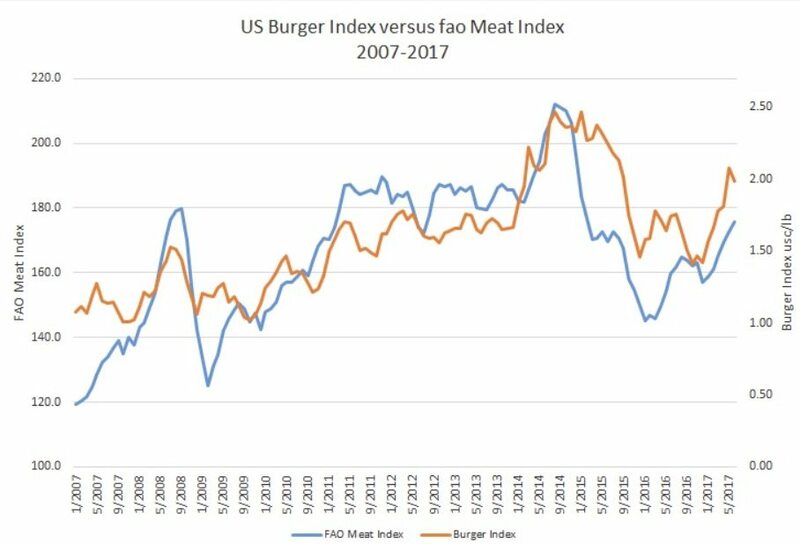 I cannot help feeling that the US domestic demand has shown that it will continue to absorb the increased beef supply, and is willing to pay more in terms of pricing which during a ‘Super Demand’ cycle period is not unusual. Even with the last quarter increased supply and pricing tells me that this phenomena is alive and well. What is unique about this demand period is the continued strong influence of export demand on US beef and the presence of China as a third strong export market that will ensure, I believe, a sustainable Super Demand cycle that might extend beyond two years. The continued growth of the middle class globally is one of the key reasons that demand has remained strong. This is well-highlighted in a paper recently released by the Brooking Institute titled, ‘The unprecedented expansion – the global middle class’. 140 million people are joining the middle-class annually and this number is expected to be 170 million in five years’ time. 88pc of the next billion middle-class entrants will live in Asia, including 380 million Indians, 350 million Chinese, and 210 million other Asians. By 2020, the middle-class will become a majority of the global population for the first time ever. By 2030, Asians could represent two-thirds of the global middle-class population. In developed countries, middle-class consumption is averaging around $19,000 per person per year at a rate of 0-0.5pc per year – and in developing countries, consumption is growing more rapidly at rates of around 6-10pc annually, but from a much lower base of only $8500 per person per year. The following table highlights how quickly the change is occurring between where the middle class is located globally – in 2015 the US had 13pc of the global middle-class, but by 2020 and 2030 this is expected to fall to 11pc and then 7pc. It is forecast that by 2030 China and India will have 39pc of the global middle class compared to 17pc back in 2015. When I spoke directly to the author, Homi Kharas he outlined to me that beef and fish were the preferred option in many of the Asian countries of the middle class as their personal wealth grows. Similar findings were found in a survey/report commissioned by Euromonitor International released in 2015 which also found in China, the popularity of pork was falling amidst a number of pork supplier safety scandals and public health campaigns designed to encourage the consumption of lower fat protein options. In the findings Euromonitor International found poultry was facing similar issues due to heightened regulations relating to recent bird flu epidemics at the time. It said these factors combined have made beef and veal the fastest growing meat category in volume terms in China, growing at a per capita rate of 5pc in 2014. Fish consumption is also growing in China as a result of similar health trends, although the premium seafood segment has lost considerable momentum due to the country’s anti-indulgence movement. There is no doubt that competing meats are one of the major threats to the continuance of the ‘Super Demand’ cycle for beef. Significantly cheaper pork and chicken could impact the price paid for beef through 2018 and 2019. Recent USDA forecasts have US beef production in 2018 up 4.8pc on 2017, pork production up 5.3pc and poultry production up 1.6pc – but interestingly, USDA forecasts on US retail pricing for each category of protein is expected to be higher for 2018, with beef and veal prices expected to increase 2-3pc, pork to be up 0.75-1.75pc and poultry up 0.25-1.25pc in value. In each instance an increase is seen in in supply and pricing, which points to expected strong demand across all protein sectors in the US. There are differing views among analysts in the US regarding chicken production forecasts, with many of the opinion that 2018 chicken production could be closer to a 4pc increase on last year due to the growth in the breeder stock and as a result are calling pricing to fall potentially 3-10pc, which is an interesting contrast view to the USDA outlook. Should the forecast on chicken prices falling in 2018 by 3-10pc due to greater volume than expected, then the projected 6-16pc increase in US and global beef prices could suffer, placing a strong dampening effect on the global beef market. Excellent article, you are right, of course, but obviously world demand or super demand does not necessarily deliver super prices to Australian Cattle Producers, is irrelevant to us, and you should research and write on what does.